The traditional Kabbalat Shabbat for those of us with our feet planted in the world of nature and science—with our heads and hearts reaching toward the heavens. Kabbalat Shabbat, the Friday evening synagogue service and festive home meal, infuses the beginning of the sacred day with celestial imagery and vivid human experiences of love and companionship among family and friends at the festive dinner table. 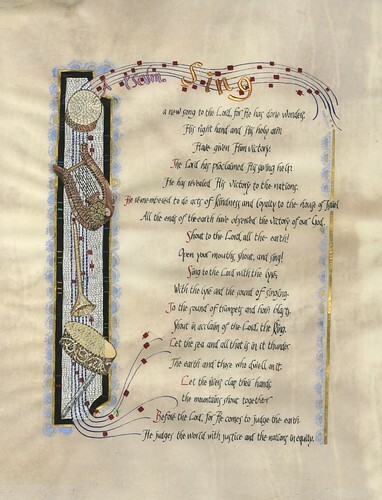 The liturgy, whether chanted in synagogue or at home, brings us into intimate connection with the Creator whose seventh-day rest we re-enact, immersing us in imagery of the glories of the flow of Divine energy through the universe, of the longing of the masculine and feminine aspects of Divinity for one another. Preparing the home offers many of us not only a routine of cooking, cleaning and table-setting chores, but a time to connect subliminally to family memories and traditions stretching back for generations. The Shabbat table—in my case a beloved heirloom that has brought together five generations of us on three continents—becomes a focus not only of weekly habit, but also of cherished lifetime memories bonding individuals, families and communities, tracing the course of weeks, years and lifetimes. As we sit down to our Shabbat dinner we welcome the loved ones newly added to our lives, the friends with whom we share our families’ lives, and always have at the back of our minds those departed loved ones once at our tables who now live in the memories of those gathered around. Not only do the Friday night festivities bond us to the Divine, our families and communities, however. 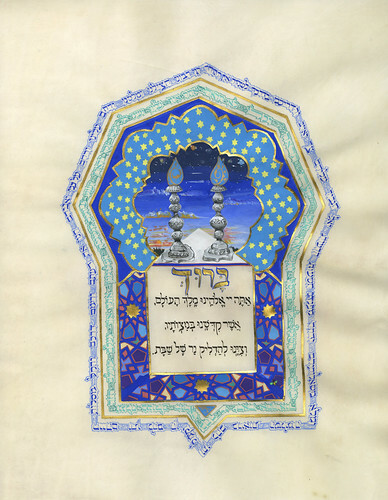 The ideas expressed in the prayers, songs and rituals, in the words and melodies, were inspired and compiled by the Jewish mystics of sixteenth century Tsfat, who themselves drew upon a continual thread of mystical studies winding back through Castile, Provence and Italy to Byzantine period Israel. 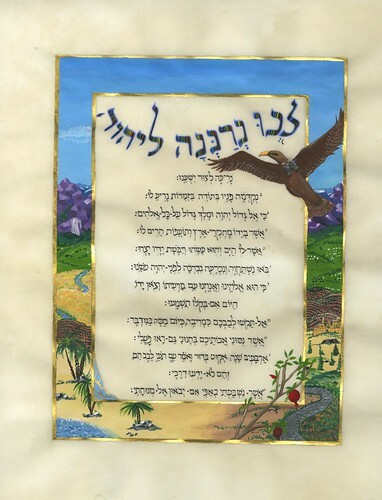 Drawing as they also do upon these diverse schools of Jewish experience and thought, our Shabbat practices also reflect the characteristics of our current daily lives, and so these words, actions and songs embody essential qualities of evolving Jewish culture. 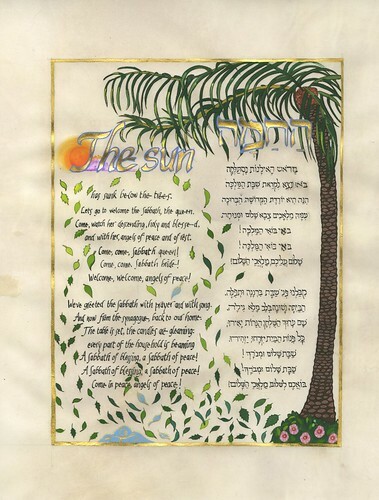 My approach to the visual interpretation of Kabbalat Shabbat offers Jewish families the chance to engage experientially in the panoply of Jewish culture that has proceeded us, and whose evolution we continue to effect. Commencing this project has brought me to a new stage in the evolution in my own thought, in my own approach to developing the visual midrash that is the hallmark of my work. Illuminating Kabbalat Shabbat offers an opportunity to interpret the beloved rituals and words through not only the lens of medieval Jewish mysticism, but also through the modern scientific culture within which we in the early twenty-first century live, work and raise our families. 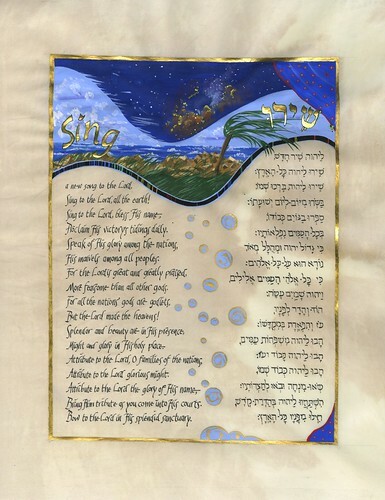 Visit the growing gallery of illuminated paintings of traditions, blessings and songs from Kabbalat Shabbat: the Grand Unification. 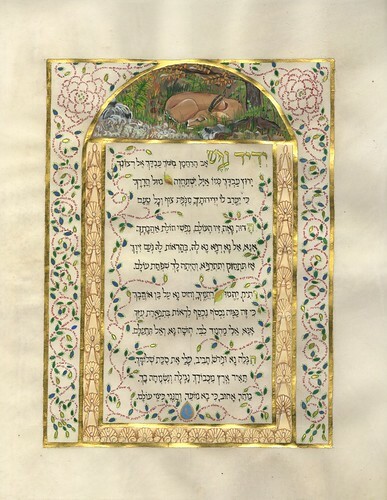 When I set out on this project, I realized that I needed to immerse myself in the Jewish mystical tradition that led to the Lurianic Kabbalistic community that developed so much of the Kabbalat Shabbat liturgy and practice. Now, despite my family’s descent from a celebrated Hasidic master, in recent generations the family consciousness became more aligned with rationalist Jewish rabbinic traditions than the primarily mystical. My thirty year marriage to an astrophysicist (indeed one descended from an even more thoroughly rationalist Lithuanian background) made me entirely comfortable in the intellectual world of modern physics and science, and more than slightly skeptical about a more mystical approach to existence than that native to mainstream traditional Judaism. However, almost immediately after beginning my immersion in studies of Jewish mysticism I discovered – to my complete incredulity—that the questions and concerns probed in Kabbalah were strikingly similar to those at the heart of the scientific world in which I’d lived my entire adult life. Kabbalah seemed to share the same concerns as cosmology and perhaps even string theory: questions concerning the beginnings of the world, the unity of all matter, appreciating and perpetuating the glorious order of the world around us. Sure that I’d made some terrible mistake, I soon found that a variety of modern physicists, mathematicians and biologists had not only come to similar realizations, but actually explored and written about these parallels. I also discovered that the scholars who originated key concepts in Jewish mysticism themselves understood that the mystical paradigm they discovered should be regarded as accessible metaphor—extreme midrash, if you will— for rendering the otherwise utterly inaccessible reality of the Divine accessible to human imagination. 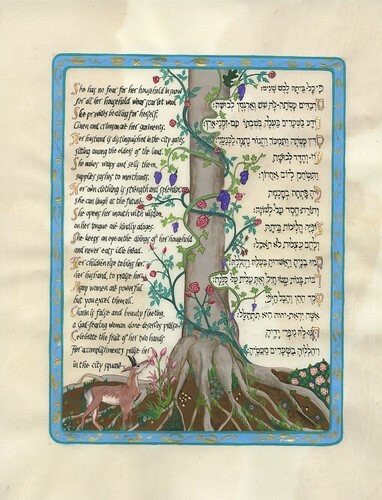 Metaphor, midrash—these are concepts to which I relate, and indeed, around which I have always constructed my visual interpretations of biblical text. 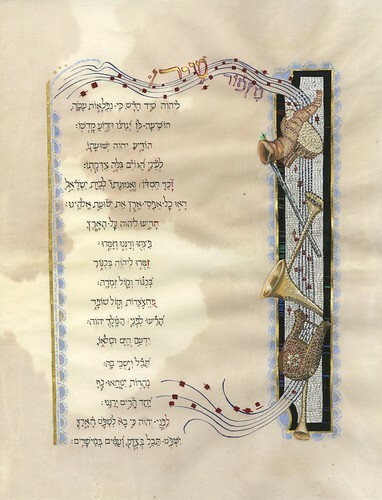 As lovely and moving as it is, I had never found the bride and groom imagery of Lurianic kabbalah wholly satisfying, and now suddenly a wholly compelling framework for this project occurred to me. Illuminating Kabbalat Shabbat offers me the ability to fuse the mystical tradition underlying its liturgy and customs with the scientific world view of our own day, to broaden our understanding of Shabbat to reflect not simply the metaphorical transference of human eros to the divine plane, but also a view of the actual unity of all matter understood within cosmology and physics. We, after all, live in the century in which Big Bang was dated, we know when the moment of B’raishit occurred. I strive here to reflect the unity of all matter, the unity of our spiritual and physical worlds. I hope that you, your family and guests will enjoy these glowing illuminations and commentaries that not only draw upon the traditional rabbinic and mystical interpretations of the texts, but from the astronomy, physics and biology that shape our twenty-first century environment. Kabbalat Shabbat: the Grand Unification will thus offer a joyful intellectual and aesthetic companion for welcoming Shabbat into the contemporary Jewish home. 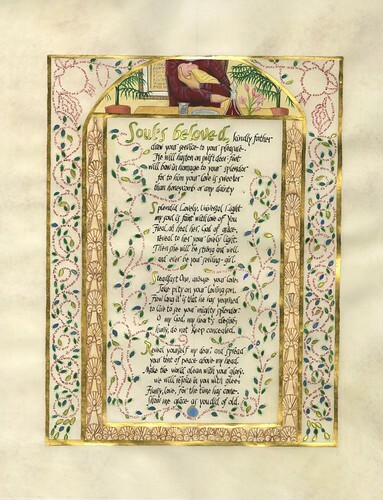 80 full-page, full color illuminated paintings plus commentary, 8″10″, approximately 225 pages. $45.00 planned. Please revisit these pages as I post more uplifting paintings and their inspiring commentaries. Please contact me by e-mail or telephone (301)765-6248 for more information.